The Thoracic Oncology Program provides high quality, state-of-the-art care for lung cancer, mesothelioma, esophageal cancer and cancer that has metastasized to the lungs. Physicians also treat rare thoracic tumors including thymomas, thymic carcinomas, cancers of the mediastinum and chest wall, and sarcomas. The Thoracic Oncology Clinic is an important program at the UCSF Helen Diller Family Comprehensive Cancer Center at Mount Zion and is one of only in Northern California to receive the prestigious designation of "comprehensive" from the National Cancer Institute. The multidisciplinary thoracic oncology team is led by David M. Jablons, M.D., Program Leader and Chief of Thoracic Surgery at UCSF. The Thoracic Oncology Laboratory supports the work of the clinic through the discovery of new treatments. Patients are also offered access to the latest therapies through clinical trials. Specialists from many areas work collaboratively to diagnose patients and custom tailor treatments. 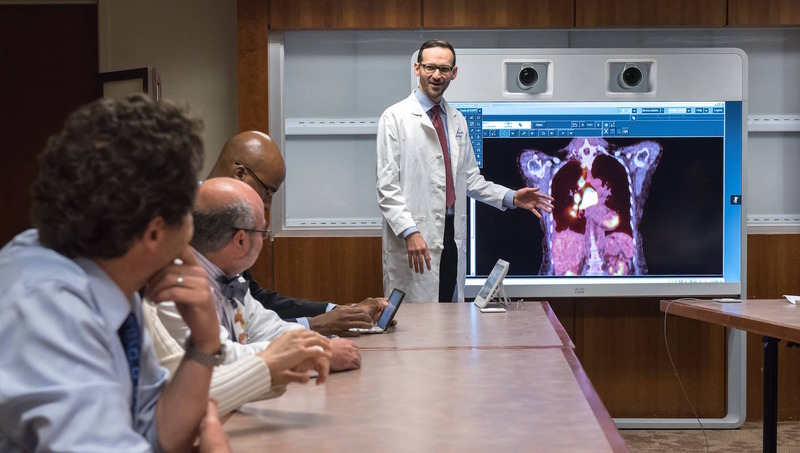 At the weekly Tumor Board Conference, physicians present the most challenging cases and receive advice and recommendations from the group.